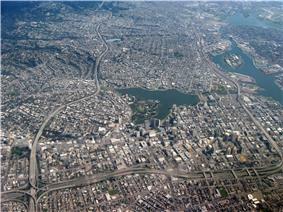 Oakland is a major West Coast port city in the U.S. state of California. The Port of Oakland is the busiest port for San Francisco Bay and all of Northern California. Oakland is the third largest city in the San Francisco Bay Area, the eighth-largest city in California, and the 45th-largest city in the U.S. with a population of 390,724 as of 2010. 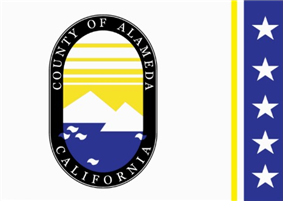 Incorporated in 1852, Oakland is the county seat of Alameda County. It serves as a major transportation hub and trade center for the entire region and is also the principal city of the Bay Area Region known as the East Bay. 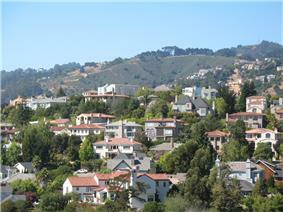 The city is situated directly across the bay, six miles (9.7 km) east of San Francisco. 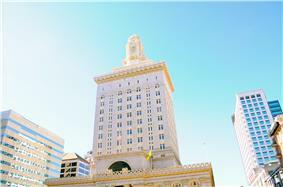 Oakland has a Mediterranean climate with an average of 260 sunny days per year. 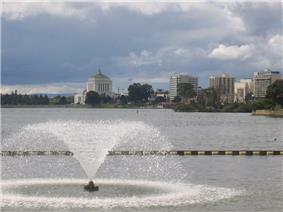 Lake Merritt, a large estuary centrally located east of Downtown, was designated the United States' first official wildlife refuge. Jack London Square, named for the author and former resident, is a tourist destination on the Oakland waterfront. While progress has been made in reducing the city's high property crime rate, violent crime has remained a persistent problem in Oakland, although this is primarily concentrated in certain neighborhoods. Oakland is continually listed among the top cities in the United States for sustainability practices, including a No. 1 ranking for usage of electricity from renewable resources. Significant portions of Oakland suffer from severe lead contamination. In recent years, Oakland has gained national recognition as a travel destination. In 2012, Oakland was named the top North American city to visit, highlighting its growing number of sophisticated restaurants and bars, top music venues, and increasing nightlife appeal. Oakland also took the No. 16 spot in "America's Coolest Cities," ranked by metrics like entertainment options and recreational opportunities per capita, etc. In 2013, Oakland topped the No. 1 spot in "America's Most Exciting Cities," notably having the most movie theaters, theater companies, and museums per square mile. In "America's Most Hipster Cities," Oakland took the No. 5 spot, cited for luring San Francisco "hippies" into the city. The earliest known inhabitants were the Huchiun, who lived there for thousands of years. The Huchiun belonged to a linguistic grouping later called the Ohlone (a Miwok word meaning "western people"). In Oakland, they were concentrated around Lake Merritt and Temescal Creek, a stream that enters the San Francisco Bay at Emeryville. The original extent of Oakland, upon its incorporation, lay south of today's major intersection of San Pablo Avenue, Broadway, and Fourteenth Street. The city gradually annexed farmlands and settlements to the east and the north. Oakland's rise to industrial prominence, and its subsequent need for a seaport, led to the digging of a shipping and tidal channel in 1902, which created an island of nearby town Alameda. In 1906, its population doubled with refugees made homeless after the 1906 San Francisco earthquake and fire. In 1916, General Motors opened a major automobile factory in East Oakland, making Chevrolet cars and then GMC trucks until 1963, when it was moved to Fremont in southern Alameda County. Also in 1916, the Fageol Motor Company chose East Oakland for their first factory, manufacturing farming tractors from 1918 to 1923. By 1920, Oakland was the home of numerous manufacturing industries, including metals, canneries, bakeries, internal combustion engines, automobiles, and shipbuilding. By 1929, when Chrysler expanded with a new plant there, Oakland had become known as the "Detroit of the West." Russell Clifford Durant established Durant Field at 82nd Avenue and East 14th Street in 1916. The first transcontinental airmail flight finished its journey at Durant Field on August 9, 1920, flown by Army Capt. Eddie Rickenbacker and Navy Lt. Bert Acosta. Durant Field was often called Oakland Airport, though the current Oakland International Airport was soon established four miles (6.4 km) southwest. During World War II, the East Bay Area was home to many war-related industries. Oakland's sharecroppers and tenant farmers who had been recruited by Henry J. Kaiser to work in his shipyards. These immigrants from the Jim Crow South brought their racial attitudes with them, and the racial harmony that Oakland blacks had been accustomed to prior to the war evaporated. Also migrating to the area during this time were many Mexican Americans from southwestern states like New Mexico, Texas, and Colorado, many working for the Southern Pacific Railroad, at its major rail yard in West Oakland. Oakland experienced its own "zoot suit riots" in downtown Oakland in 1943 in the wake of the one in Los Angeles. In 1946 National City Lines (NCL), a General Motors holding company, acquired 64% of Key System stock; during the next several years NCL engaged in the conspiratorial dissolution of Oakland's electric streetcar system, where the city's electric streetcar fleet was converted to diesel buses. The state Legislature created the Alameda and Contra Costa Transit District in 1955, which still exists today as AC Transit, the third-largest bus-only transit system in the nation. Soon after the war, with the disappearance of Oakland's shipbuilding industry and the decline of its automobile industry, jobs became scarce. There was also an increase in racial tension. 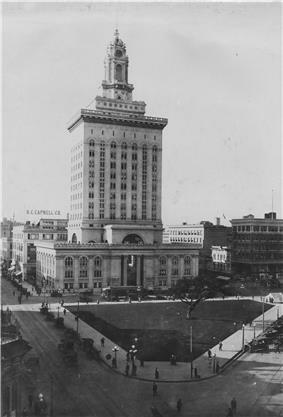 Oakland was the center of a general strike during the first week of December 1946, one of six cities across the country that experienced such a strike after World War II. In 1960, Kaiser Corporation erected its headquarters, it was the largest skyscraper in Oakland, as well as "the largest office tower west of Chicago" up to that time. In 1966, only 16 of the city's 661 police officers were black. Tensions between the black community and the largely white police force were high, and police malfeasance against blacks was common. The Black Panther Party was founded by students Huey Newton and Bobby Seale at Merritt College. During the 1970s, Oakland began to experience serious problems with gang-controlled dealing of heroin and cocaine when drug kingpin Felix Mitchell created the nation's first large-scale operation of this kind. Both violent crime and property crime increased during this period, and Oakland's murder rate rose to twice that of San Francisco or New York City. As in many other American cities during the 1980s, crack cocaine became a serious problem in Oakland. Drug dealing in general, and the dealing of crack cocaine in particular, resulted in elevated rates of violent crime, causing Oakland to consistently be listed as one of America's most crime-ridden cities. During the late 1980s and early 1990s, Oakland's black population reached its peak at approximately 47% of the overall population. On October 20, 1991, a massive firestorm swept down from the Berkeley Hills above the Caldecott Tunnel. Twenty-five people were killed, 150 people were injured, and nearly 4,000 homes destroyed. With the loss of life and an estimated economic loss of $1.5 billion, this was the worst urban firestorm in American history. During the mid-1990s, Oakland experienced an improved economy compared to previous decades, with large development and urban renewal projects, concentrated especially in the downtown area, at the Port of Oakland and at the Oakland International Airport. The Loma Prieta earthquake, a rupture of the San Andreas fault that affected the entire San Francisco Bay Area, occurred on October 17, 1989. The quake's surface wave measured 6.9 on the Richter magnitude scale, and many structures in Oakland were badly damaged. The double-decker portion of the freeway (Interstate 880) structure collapsed. A section of the eastern span of the San Francisco – Oakland Bay Bridge also collapsed and was closed to traffic for one month. After his 1999 inauguration, Oakland Mayor Jerry Brown continued his predecessor Elihu Harris' public policy of supporting downtown housing development in the area defined as the Central Business District in Oakland's 1998 General Plan. Brown's plan and other redevelopment projects were controversial due to potential rent increases and gentrification, which would displace lower-income residents from downtown Oakland into outlying neighborhoods and cities. Further hampering Oakland's economic recovery were the economic crises in 2001 and 2008. These downturns resulted in lowered sales, rentals and occupancy of the new housing and slower growth and economic recovery than expected. Due to misconduct by the Oakland Police Department, the City of Oakland has paid a total of $57 million during the 2001–2011 timeframe to victims of police abuse—the largest sum of any city in California. On October 10, 2011, protesters and civic activists began "Occupy Oakland" demonstrations at Frank Ogawa Plaza in Downtown Oakland. Oakland's highest point is near Grizzly Peak Blvd, east of Berkeley, just over 1,760 feet (540 m) above sea level at about . Oakland has 19 miles (31 km) of shoreline, but Radio Beach is the only beach in Oakland. Oaklanders refer to their city's terrain as "the flatlands" and "the hills", which until recent waves of gentrification have also been a reference to Oakland's deep economic divide, with "the hills" being more affluent communities. About two-thirds of Oakland lies in the flat plain of the East Bay, with one-third rising into the foothills and hills of the East Bay range. Based on data gathered by the National Oceanic and Atmospheric Administration, Oakland is ranked No. 1 in climate among U.S. cities. Oakland's climate is typified by the temperate and seasonal Mediterranean climate. 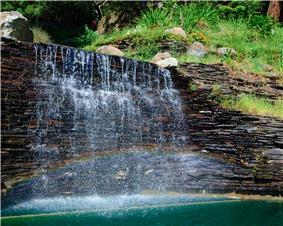 Summers are usually dry and warm and winters are mild and damp. More specifically, it has features found in both nearby coastal cities such as San Francisco and inland cities such as San Jose, making it warmer than San Francisco and cooler than San Jose. Its position on San Francisco Bay across from the Bay Bridge means that the Northern part of the city can experience cooling maritime fog. It is far enough inland, though, that the fog often burns off by midday, allowing it to have typically sunny California days. The hills tend to have more fog than the flatlands, as the fog drifts down from Berkeley. The higher rainfall in the hills supports woods of oak, madrone, pine, fir and a few redwood groves in the wetter areas. Before being logged in the 19th century, some of the tallest redwood trees in California (even used for navigation by ships entering the Golden Gate) may have stood in the Oakland Hills. One old stump 30 feet across can still be seen near Redwood Regional Park. Sunny, drier slopes are grassy or covered in scattered oaks and chaparral brush. Australian eucalyptus trees have been extensively planted in many areas. Ruptures along the nearby San Andreas fault caused severe earth movement in the San Francisco Bay Area in 1906 and 1989. San Andreas quakes induces creep (movement occurring on earthquake faults) in the Hayward fault, which runs directly through Oakland, Berkeley, San Jose and other Bay Area cities. In 1991, an urban conflagration, the Oakland Hills Fire, destroyed nearly 4,000 homes and killed twenty five people in the Oakland hills range; it was the worst urban firestorm in American history. Oakland has the fifth largest cluster of "elite zip codes" ranked by the number of households with the highest combination of income and education. 37.9% of residents over 25 years of age have bachelors degree or higher. Oakland ranked among the top cities with residents with bachelor degrees and graduate degrees per square mile. Oakland ranks in the top 20 of American cities in median household income, with a 2012 value of $51,863. In 2012, the median income for a household in the city was $51,863 and the median income for a family was $59,459. The mean income for a household was $77,888 and the mean income for a family was $90,948. Males had a median income of $50,140 versus $50,304 for females. The unemployment rate as of December 2013 is 9.7%. In 2008 the median income for a household in the city was $48,596 and the median income for a family was $55,949. Males had a median income of $46,383 versus $44,690 for females. The per capita income for the city was $30,094. In 2007 approximately 15.3 percent of families and 17.0 percent of the general population were below the poverty line, including 27.9 percent of those under age 18 and 13.1 percent of those age 65 or over. 0.7% of the population is homeless. Home ownership is 41% and 14% of rental units are subsidized. The unemployment rate as of August 2009 is 15.2%. Oakland is one of the most ethnically diverse major cities in the country. Oakland was ranked the 4th most diverse city in America, with an overall diversity score of 91.4. The city's formerly most populous ethnic group, whites, declined from 95.3% in 1940 to 32.5% by 1990. Since the 1960s, Oakland has been known as a center of Northern California's African-American community. However, between 2000 and 2010 Oakland lost nearly one-fourth of its black population. 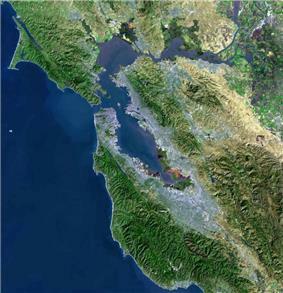 The city demographics have changed due to a combination of gentrification, along with many blacks relocating to Bay Area suburbs, or moving to the Southern United States. Blacks formed a strong plurality for many years, peaking in 1980 at about 47% of the population of Oakland. If Hispanic whites are considered a separate ethnic group from non-Hispanic whites, black residents maintained their status as Oakland's single largest ethnic group as of 2010, forming 27% of the population, followed by non-Hispanic whites at 25.9%, and Hispanics of any race at 25.4%. Recent trends and cultural shifts have led to a decline among some of Oakland's longstanding black institutions, such as churches, businesses, and nightclubs, which has been a point of contention for some long-time black residents. In recent years, immigrants and others have marched by the thousands down Oakland's International Boulevard in support of legal reforms benefiting illegal immigrants. Oakland is a major West Coast port, and the fifth busiest in the United States by cargo volume. The Port of Oakland handles 99% of all containerized goods moving through Northern California, representing $41 billion worth of international trade. There are nearly 200,000 jobs related to marine cargo transport in the Oakland area. These jobs range from minimum wage hourly positions to Transportation Storage and Distribution Managers who earn an annual average salary of $91,520. The Port of Oakland was an early innovator/pioneer in the technologies of Intermodal Containerized Shipping. The city is also home to several major corporations including Kaiser Permanente and Clorox, as well as the corporate headquarters for national brands such as Dreyer's ice cream, and retailer Cost Plus World Markets. Tech companies such as Ask.com and Pandora Radio are located in Oakland, and in recent years many start-up high tech and green energy companies have found a home in the downtown neighborhoods of Uptown, City Center, Jack London Square and Lake Merritt Financial District. In 2014, Oakland was the fifth ranked city for tech entrepreneurs by total venture capital investment. As of 2013, the San Francisco-Oakland-Hayward has a GDP (Gross Domestic Product) of $360.4 billion, ranking eighth among metropolitan areas in the United States. In 2014, Oakland was amongst the best cities to start a career, the highest ranked city in California after San Francisco. Additionally, Oakland ranked fourth in cities with professional opportunities. 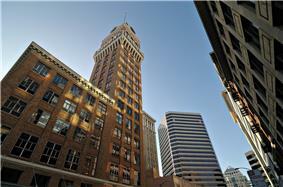 Numerous companies in San Francisco continue to expand in or migrate over to Oakland. Oakland has gained increasing appeal as a travel destination, both nationally and internationally. 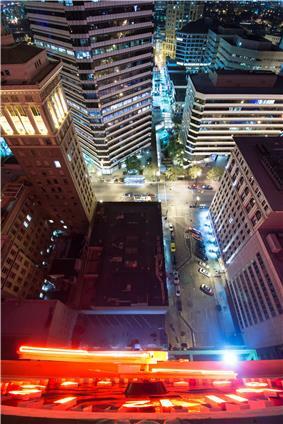 Downtown Oakland has an assortment of bars and nightclubs. They include dive bars, dance clubs, modern lounges and jazz bars. The Paramount Theater features headlining musical tours and productions, while Fox Oakland Theatre draws various musical genres including jam bands, rock, punk, blues, jazz, and reggae. The Paramount and Fox theaters often book simultaneous events creating busy nights uptown. In 2012, Oakland was dubbed a "New Sin City," following it's 2010 decision to relax its cabaret laws, which gave a boost to its night club and bar scene. 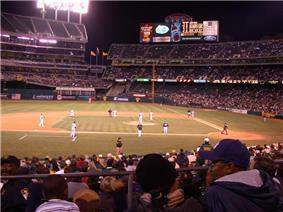 Oakland has teams in three professional sports: Baseball, basketball, and football. The Oakland Athletics MLB club won three consecutive World Series championships in 1972, 1973, and 1974, and appeared in another three consecutive World Series from 1988 to 1990, winning their fourth championship in 1989. The Golden State Warriors won the 1974–1975 NBA championship. The Oakland Raiders of the NFL won Super Bowl XI in 1977 and Super Bowl XV in 1981, while also appearing in Super Bowl II in 1968 and Super Bowl XXXVII in 2003. The Raiders left Oakland for Los Angeles in 1982, where they won a third Super Bowl championship, and returned to Oakland in 1995. The Warriors announced in April 2014 that they will leave Oakland once their new arena is built across the Bay in San Francisco, while the Raiders are in discussion with city officials about building a new football-only stadium. ^ "Bump City | The Oakland Standard". Museumca.org. Retrieved 2013-07-08. ^ "Mayor". City of Oakland, California. Retrieved November 11, 2014. ^ "Oakland (city) QuickFacts from the US Census Bureau". Quickfacts.census.gov. Retrieved 2,013-07-08. ^ "Geographic Identifiers: 2010 Demographic Profile Data (G001): Oakland city, California". U.S. Census Bureau, American Factfinder. Retrieved May 1, 2013. ^ "The 45 Places to Go in 2012". The New York times. Retrieved 9 May 2014. ^ "America's Coolest Cities". Forbes. Retrieved 9 May 2014. ^ "The 10 Most Exciting Cities in America". Movoto. Retrieved 9 May 2014. ^ "America's Most Hipster Cities". Thrillest. Retrieved 9 May 2014. ^ "Oakland-california.co.tv". Oakland-california.co.tv. Retrieved April 19, 2012. 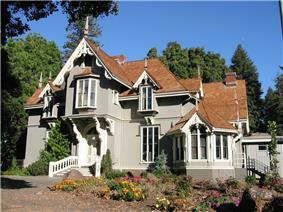 ^ "Oaklandcaliforniarealestate.biz". Oaklandcaliforniarealestate.biz. Retrieved April 19, 2012. ^ "Oakland's Early History, Edson F. Adams, 1932". Freepages.genealogy.rootsweb.ancestry.com. Retrieved 2013-11-26. ^ "The Traveler: The Newsletter of the Lincoln Highway Association—California Chapter. Fall 2001. Wes Hammond. ''Highway Nostalgia. Manufacturing Trucks Adjacent to the Lincoln Highway: Fageol Truck and Coach Company. Oakland, California, 1916–1938''". Lincolnhighwayassoc.org. Retrieved April 19, 2012. ^ "Vintage Tractors. ''Fageol''". Vintagetractors.com. January 7, 1919. Retrieved April 19, 2012. ^ "Photo collection: ''New or greatly enlarged industrial establishments of Oakland and East Bay cities.'' by Oakland (Calif.) Chamber of Commerce. ca. 1917. Oakland Public Library, Oakland History Room". Content.cdlib.org. February 24, 2007. Retrieved April 19, 2012. ^ "Oakland Tribune, May 5, 1929. ''Chrysler plant''". Newspaperarchive.com. Retrieved April 19, 2012. ^ "East Oakland Community Information Book 2001". Alameda County Health Services Agency. Archived from the original on December 30, 2012. ^ "Aerofiles.com. ''Durant''". Aerofiles.com. Retrieved April 19, 2012. ^ "U.S. Centennial of Flight Commission. ''The U.S. Post Office Flies the Mail, 1918–1924''". Centennialofflight.gov. Retrieved April 19, 2012. ^ "H.G. Prince Employees ". Oakland Museum of California. Archived from the original on December 30, 2012. Oakland's location, where rail and water transportation meet, made it an ideal site for canneries. 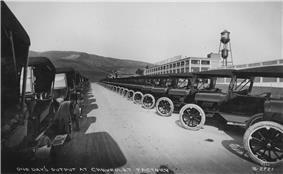 Shippers brought produce from all over California for canning at several large plants—including the Josiah Lusk Canning Company, the Oakland Preserving Company (which developed the Del Monte brand), and the California Packing Company, which took over the H. G. Prince Company between 1925 and 1930. In 1943, the Oakland Tribune reported that the $100,000,000 canning industry in Oakland ranked second only to shipbuilding in value. ^ a b "UC Berkeley Graduate School of Journalism. Elena Conis, 2002. ''From Horses to Hybrid: A Century of East Bay Transport''". Journalism.berkeley.edu. Retrieved April 19, 2012. ^ The furniture of Sam Maloof. Google Books. 2001. ^ Crack In America: Demon Drugs and Social Justice - Craig Reinarman, Harry Gene Levine - Google Books. Books.google.com. 1997. ^ "Some faults revealed by firestorm remain uncorrected". www.ktvu.com. Retrieved 2012-07-24. ^ Edward Iwata, of the examiner staff (February 16, 1997). "On the road to economic success, where we work". ^ Gammon, Robert (January 3, 2007). "Inflating the Numbers, The Brown administration came very close on the 10K Plan. So why the grade inflation?". ^ Lake Merritt Institute. Retrieved April 12, 2011. ^ "A Brief History". Lake Merritt Institute. Retrieved August 24, 2011. ^ "Relocation information: Oakland Facts". Chamber of Commerce. Retrieved July 13, 2011. As published in 1993 by Rand McNally. ^ "New York City tops in population; 8 more cities above 1M - The Business Journals". Bizjournals.com. 2012-04-05. Retrieved 2013-07-08. ^ "2010 Census Interactive Population Search: CA - Oakland city". U.S. Census Bureau. Retrieved July 12, 2014. ^ "Washington: A World Apart". Washington Post. Retrieved 9 May 2014. ^ "Community Facts". American Fact Finder. Retrieved 14 May 2014. ^ Winter, Michael. "New measure ranks San Francisco the 'smartest' U.S. city". USA Today. Retrieved 14 May 2014. ^ "Median Household Income (In 2003 Inflation-adjusted Dollars)". American Community Survey. Archived from the original on 2008-03-23. Retrieved 14 May 2014. ^ "Community Facts". American Fact Finder. Retrieved 9 May 2014. ^ "Milestones in 2013". State of the City 2013 Report. Retrieved 9 May 2014. ^ "The Top 10 Most Diverse Cities in America". CNBC.com. May 17, 2011. Retrieved June 13, 2012. ^ "Most Diverse Cities in America". Nerd Wallet. Retrieved 9 May 2014. ^ a b Kuruvila, Matthai (March 11, 2011). "Oakland's black experience still inherent to city". The San Francisco Chronicle. ^ "Census: Blacks are moving to the South : News-Record.com : Greensboro & the Triad's most trusted source for local news and analysis". News-Record.com. March 22, 2009. Archived from the original on March 25, 2009. Retrieved April 19, 2012. ^ Frey, William H. (May 4, 2011). "Melting Pot Cities and Suburbs: Racial and Ethnic Change in Metro America in the 2000s". Metropolitan Policy Program. Brookings Institute. Retrieved August 4, 2011. ^ "Oaklandnet.com" (PDF). Retrieved April 19, 2012. ^ "'"Nation Sees Effects of 'Day Without Immigrants. ^ "2000 Census information on Gay and Lesbian Couples, by Incorporated place Incorporated place, by highest percentage". www.gaydemographics.org. Archived from the original on December 30, 2012. ^ "Race and Hispanic Origin for Selected Cities and Other Places: Earliest Census to 1990". U.S. Census Bureau. Retrieved April 20, 2012. ^ "North American Container Traffic: 2011 Port Ranking by TEUs". American Association of Port Authorities. Retrieved 11 May 2013. ^ "Facts & Figures". Port of Oakland. Retrieved 9 May 2014. ^ "Making California Ports More Competitive". California Chamber of Commerce. Retrieved 9 May 2014. ^ "Top 10 Cities for Tech Entrepreneurs". Wealth Management. Retrieved 9 May 2014. ^ "Top 100 U.S. Metro Economies". Metro Economics Report. Retrieved 14 May 2014. ^ Kiernan, John. "Best & Worst Cities to Start a Career". Wallet Hub. Retrieved 14 May 2014. ^ Torres, Bianca. "Tenant spillover from San Francisco to the East Bay tops 300,000 square feet". San Francisco Business Times. Retrieved 15 May 2014. ^ "Tourism Facts and Figures". Visit Oakland. Retrieved 10 May 2014. ^ King, Danny. "Hotel Demand Thriving in three secondary U.S. markets". Travel Weekly. Retrieved 10 May 2014. ^ Robert, Mandelbaum. "Recovery Momentum picks up outside major markets". Hotel Management. Retrieved 10 May 2014. ^ Wilkey, Robin. "Oakland Ranked Number Five In New York Times 45 Places To Go In 2012". Huffington Post. Retrieved 14 May 2014. ^ Boyd, Maya. "Travel" The top 5 things to do in California". Metro Travel. Retrieved 14 May 2014. ^ "America's Top Twelve ArtPlaces". Art Place America. Retrieved 9 May 2014. ^ "Top 25 Cities for Designers and Artists". Artbistro. Retrieved 14 May 2014. ^ "From the dept. of nightlife | Oakland Tribune Outtakes". Ibabuzz.com. November 5, 2008. Retrieved April 19, 2012. ^ "Move Over Vegas, These Are the New Sin Cities". Forbes. Retrieved 9 May 2014. ^ "A Monthly Night of Art Outgrows its Name". The New York Times. Retrieved 9 May 2014. ^ "Oakland's Art Murmur: A New Roar?". Oakland Art Murmur. Retrieved 9 May 2014. ^ LeBeau, Eleanor (2006). "Sampling Oakland". Art Papers (getthisgallery.com) (Nov/Dec): 68. Retrieved June 12, 2011. ^ Ward, Jennifer Inez (April 2, 2010). "Here is where the Gertrude Stein quote ends". Oakland Local. Retrieved June 12, 2011. ^ Wang, Annie. "Top 10 Urban Destinations for Nature Lovers". NerdWallet. Retrieved 14 May 2014. ^ . "Councilmember Profile ~ City of Oakland, California". .oaklandnet.com. Retrieved 2014-08-07. ^ Gammon, Robert (November 10, 2011). "Breaking news: Jean Quan wins mayor's race". ^ McArdle, Phil (2007). Oakland Police Department. Images of America. Arcadia. p. 95. ^ Boyarsky, Bill (2007). Big Daddy: Jesse Unruh and the Art of Power Politics. University of California Press. p. 61. ^ "Partisan Voting Index Districts of the 113th Congress". The Cook Political Report. Retrieved November 30, 2014. ^ a b Rosen, Eva; Sudhir Venkatesh (2007). "Annual Review of Law and Social Science". Legal Innovation and the Control of Gang Behavior 3 (1): 255–270. ^ "Oakland Moves From 3rd To 5th In Most Dangerous City Survey". ^ "Homicides in Oakland rise for the first time in four years « Oakland Police Officer's Association". Opoa.org. December 30, 2011. Retrieved April 19, 2012. ^ a b Robert Rogers and Harry Harris Oakland Tribune. "Oakland police vow to intensify anti-violence efforts after four shooting deaths in six hours". Inside Bay Area. Retrieved 2013-03-26. ^ Muhammed, David. "Combined Efforts Working to Stem Oakland's Crime". Contra Costa Times. Retrieved 10 May 2014. ^ Gammon, Robert. "Reality Check: Violent Crime is Down in Oakland". East Bay Express. Retrieved 10 May 2014. ^ "OPD Command Staff At Public Safety Meeting". Oakland Net. Retrieved 10 May 2014. ^ Kerr, Dara (January 3, 2011). "Oakland memorializes the 94 homicides of 2010 – Oakland North : North Oakland News, Food, Art and Events". Oaklandnorth.net. Retrieved April 19, 2012. ^ Spiker, Steve; Garvey, John; Arnold, Kenyatta; Williams, Junious (March 9, 2009). "Homicides in Oakland" (PDF). Urban Strategies Council. Retrieved October 29, 2011. ^ By Tammerlin DrummondOakland Tribune Columnist. "Drummond: David Kennedy talks Oakland and Ceasefire - San Jose Mercury News". Mercurynews.com. Retrieved 2013-08-16. ^ Will Kane (August 15, 2013). "8 arrested in Oakland crime crackdown". SFGate. Retrieved 2013-08-16. ^ "Oakland Boosts 'Operation Ceasefire' After Baby, Father Killed « CBS San Francisco". Sanfrancisco.cbslocal.com. 2013-08-08. Retrieved 2013-08-16. ^ Will Kane (2013-08-10). "Oakland police's new push on Ceasefire program". SFGate. Retrieved 2013-08-16. ^ "OUSD Schools & Principals 2006–2007". Oakland Unified School District. Archived from the original on December 30, 2012. Retrieved August 31, 2007. ^ "OUSD Board of Education Overview". Oakland Unified School District. Archived from the original on December 30, 2012. Retrieved August 31, 2007. ^ "Myschool.org". Myschool.org. Retrieved April 19, 2012. ^ "Oaklandcharter.net". Oaklandcharter.net. Retrieved April 19, 2012. ^ The Business Journals by David Goll (November 18, 2001). "East Bay Business Times. November 16, 2001. David Goll. ''Cal State launches centers in Oakland.''". Bizjournals.com. Retrieved April 19, 2012. ^ Oaklandnet.com Oakland Higher Education Consortium. ^ Liedtke, Michael (Aug 23, 2011). "MediaNews combining most SF Bay area newspapers into 2 new brands, eliminating 120 jobs". Associated Press. Associated Press. Retrieved August 27, 2011. ^ Characteristics: 2005–2007"Economic"Oakland city, California – Selected . 2005–2007 American Community Survey 3-Year Estimates (data set). ^ Characteristics: 2005–2007"Housing"Oakland city, California – Selected . 2005–2007 American Community Survey 3-Year Estimates (data set). U.S. Census Bureau. 2007. Retrieved October 29, 2011. ^ "Linus Bike Commends Oakland After It Is Listed in Top 10 Commuter Bike Cities". PRWeb. 15 November 2012. Retrieved 25 December 2012. ^ Zendle, Les; Regina E. Herzlinger (2004). Consumer-driven health care: implications for providers, payers, and policymakers. San Francisco: John Wiley and Sons. p. 661. ^ "Interactive City Directory". Sister-cities.org. Retrieved 2014-08-07. 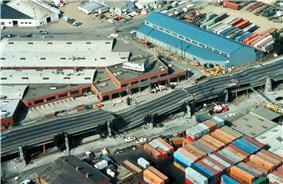 In 1989, the Loma Prieta earthquake caused the Cypress Street Viaduct double-deck segment of the Nimitz Freeway to collapse, killing 42 people. The old freeway segment had passed through the middle of West Oakland, forming a barrier between West Oakland neighborhoods. Following the earthquake, this section was rerouted around the perimeter of West Oakland and rebuilt in 1999. The east span of the San Francisco – Oakland Bay Bridge also suffered damage from the quake when a 50-foot (15-m) section of the upper deck collapsed onto the lower deck; the damaged section was repaired within a month of the earthquake. As a result of Loma Prieta, a significant seismic retrofit was performed on the western span of the Bay Bridge. The eastern span is currently being replaced, with a projected completion date of 2014. Bus transit service in Oakland and the inner East Bay is provided by the Alameda and Contra Costa Transit District, AC Transit. The district originated in 1958 after the conspiratorial dissolution of the Key System of streetcars Citation Needed. Many AC Transit lines follow old routes of the Key System. Oakland residents have access to the three major airports of the San Francisco Bay Area: Oakland International Airport, San Francisco International Airport, and San Jose International Airport. Oakland International Airport, located within the city limits of Oakland, is 4 mi (6.4 km) south of downtown Oakland and serves domestic and international destinations. 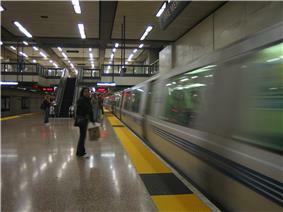 AC Transit provides 24-hour service to the airport, and the AirBART shuttle provides frequent service between the airport and BART's Oakland Coliseum Station. Oakland is served by major television stations broadcasting primarily out of San Francisco and San Jose. The region's Fox affiliate, KTVU, is based in (and licensed to) Oakland at Jack London Square along with co-owned independent station KICU-TV (licensed to San Jose). 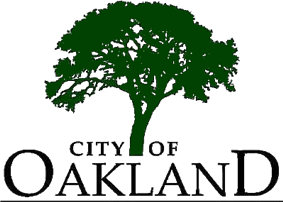 In addition, the city is served by various radio stations as well; AM stations KKSF, KMKY, KNEW and KQKE are licensed to Oakland. Oakland's three largest public high schools are McClymonds High School, respectively). Most public schools in Oakland are operated by the Oakland Unified School District (OUSD), which covers the entire city of Oakland; due to financial troubles and administrative failures, it has been in receivership by the state of California since 2002. The Oakland Unified School District (2006–2007) includes 59 elementary schools, 23 middle schools, 19 high schools, with 9 alternative education schools and programs, 4 adult education schools and early childhood education centers at most of the elementary schools There are 46,000 K–12 students, 32,000 adult students, and 6,000 plus employees. In the 2005 results of the STAR testing, over 50 percent of students taking the test performed "below basic," while only 20 percent performed at least "proficient" on the English section of the test. Some individual schools have much better performance than the city-wide average, for instance, in 2005 over half the students at Hillcrest Elementary School in the Montclair upper hills neighborhood performed at the "advanced" level in the English portion of the test, and students at Lincoln Elementary School in the Chinatown neighborhood performed at the "advanced" level in the math portion. In 2012, Oakland implemented a gang violence reduction plan used previously in other cities, Operation Ceasefire, based in part on the research and strategies of author David M. Kennedy. Among Oakland's 35 police patrol beats, violent crime remains a serious problem in specific East and West Oakland neighborhoods. In 2008, homicides were disproportionately concentrated: 72% occurred in three City Council districts, District 3 in West Oakland and Districts 6 and 7 in East Oakland, even though these districts represent only 44% of Oakland's residents. Oakland's police force has dropped to 612 officers, down from more than 800 in 2009, and far below the 925 recommended by the city's strategic plan, but Oakland recently started to rebuild its force by hiring more often and recently graduating 34 officers. Although the police department's resources have been diminishing, according to former Police Chief Howard Jordan the Oakland Police Department is committed to improved public safety by increasing police presence during peak crime hours, improving intelligence gathering, and moving more aggressively to arrest violent crime suspects. Oakland's crime rate began to escalate during the late 1960s, and by the end of the 1970s Oakland's per capita murder rate had risen to twice that of its neighbor city, San Francisco, or that of New York City. The rise in crime may have been an effect of the different method that was used to deal with rebellious youth. Prior to 1960, there were successful government funded social programs, where workers would work in neighborhoods searching for rebellious teens to enter them in youth centers that would be able to teach them proper values and improve their behavior. However, by the late 1960s,the police and Federal Bureau of Investigation(FBI) used military tactics to manage unwanted behavior, that then led to an increase in crime and imprisonment. During the first decade of the 21st century Oakland has consistently been listed as one of the most dangerous large cities in the United States. Until 2010 the homicide rate dropped four times in a row, and violent crime in general had dropped 27%. Violent crime in general, and homicides in particular, increased during 2011. In 2012 Oakland reported 131 homicides, the highest since 2006 (when there were 148 recorded). In 2013, there was a 33% decrease in homicides, allowing Oakland to record its lowest homicide count since 2004. Aggravated assaults were down 10% and rapes declined by 27%, reaching its lowest level in eight years. In the first quarter of 2014, homicides, aggravated assaults, and burglaries were down 15% relative to 2013. Additionally, shootings were down 31% and robberies were down 36%. 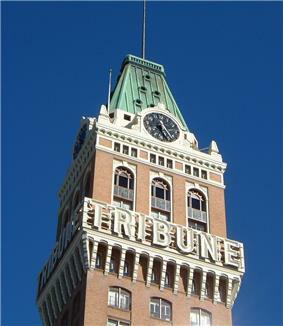 Oakland was politically conservative from the 1860s to the 1950s, led by the Republican-oriented Oakland Tribune newspaper. In the 1950s and '60s, the majority stance shifted to favor liberal policies and the Democratic Party. Oakland has by far the highest percentage of registered Democrats of any of the incorporated cities in Alameda County. As of 2009, Oakland has 204,646 registered voters, and 140,858 (68.8%) are registered Democrats, 12,248 (5.9%) are registered Republicans, and 41,109 (20.1%) decline to state a political affiliation. Oakland is widely regarded as being one of the most liberal major cities in the nation. The Cook Partisan Voting Index of Congressional District 13, which includes Oakland and Berkeley, is D+37, making it the fourth most Democratic congressional district in the US. In the state legislature, Oakland is in the 9th Senate District, represented by Democrat Loni Hancock, and is split between the 15th and 18th Assembly districts, represented by Tony Thurmond and Rob Bonta, respectively. In the United States House of Representatives, Oakland is in California's 13th congressional district, represented by Democrat Barbara Lee. Oakland has a mayor-council government. The mayor is elected for a four-year term. The Oakland City Council has eight council members representing seven districts in Oakland with one member elected at-large; council members serve staggered four-year terms. The mayor appoints a city administrator, subject to the confirmation by the City Council, who is the chief administrative officer of the city. Other city officers include: city attorney (elected), city auditor (elected), and city clerk (appointed by city administrator). Oakland's Mayor is subject to a tenure limited to two terms. There are no term limits for the city council. Council member Larry Reid, also serving as vice-mayor, was elected to a fifth term in November 2012. Some of the most prominent places of worship in Oakland include: First Congregational Church of Oakland, Evangelistic Outreach Center, Green Pastures, the Presbyterian, First Presbyterian Church of Oakland; Greek Orthodox Ascension Cathedral; the Roman Catholic Cathedral of Christ the Light; the United Methodist Chinese Community Church; the Unitarian First Unitarian Church; the Mormon Oakland California Temple; the Muslim, 31st Street Islamic Center, Light-House Mosque; the Reform Jewish Temple Sinai; the Conservative Jewish, Temple Beth Abraham; Allen Temple Baptist Church; and the Orthodox Jewish, Beth Jacob Congregation, American Baptist; Faith Baptist Church of Oakland, St. Paul Lutheran, six Kingdom Halls of Jehovah's Witnesses and St. Vartan Armenian Apostolic Church. In 2013, Oakland ranked 4th among American cities as an urban destination for nature lovers.